A regular e-newsletter is one of the best ways to build relationships with prospects, and stay in touch with your customers or clients. But how do you send your e-newsletter? If you’re a small enough business to wonder if the monthly expense is worth subscribing to an email marketing service — don’t wonder any longer. Do it! Why do you want to know these things? If your list is large enough, you can test things like two different subject lines or two different calls-to-action by running what’s called an A/B split test. Just choose this option and your email marketing service will automatically split a portion of your list into two different groups. You can track which subject line or call-to-action got the best response, and use that in your mailing to your full list. By integrating your email marketing service with your website, you can run lead generation campaigns to add prospects to your mailing list. When someone fills out the sign-up form on your site, their name is automatically added to your mailing list with your email marketing service. She receives a confirmation in her email inbox, and you receive a confirmation about a new subscriber. Entire email campaigns can be set up as autoresponders within your email marketing service. Once it’s set up there’s no more action required on your part, but prospects will automatically receive emails at designated intervals. For more on autoresponders click here. Most email marketing services offer automatic social media integration. Share buttons within the newsletter and automatic publishing on your social media profiles when you send your newsletter to your list. Your newsletter does no good if it lands in your lists’ spam or junk folder. The CAN-SPAM Act of 2003 established strict national standards for commercial emails (including newsletters) that are enforced by the Federal Trade Commission. Email marketing services know how to keep your newsletters in your lists’ inbox, and know the spam laws. You don’t have to be an expert at those too. As I mentioned above, you can develop entire email campaigns, autoresponder series, send out e-blasts, segment your list into targeted niche groups for specific emails…the list goes on. 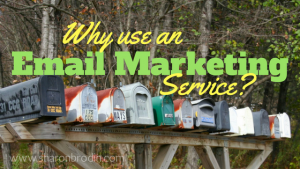 Which email marketing service should you use? For now, do an online search for “best email marketing service” and you’ll find several “best of” listings. Start your research with the top 5-10 of each listing. These lists often include a comparison chart of the features each gives you. Click here for an example. Here’s an article from WebsiteSetup.com with a more in-depth look at 10 of the top email marketing services. I recommend reading through this, too. Sure all the services offer a free trial—but it’s a lot of work importing your email list in each, and then getting a feel for how they operate. My advice is research well even before going with the free trials. I started out with iContact. Though happy with almost everything, I switched a couple years ago due to their ghastly default sign-up form. I couldn’t take it anymore, and they had no plans to improve them. I switched to GetResponse. Once I got used to it (they’re all a little different) their design process is comparable and their signup forms are much more pro-looking. 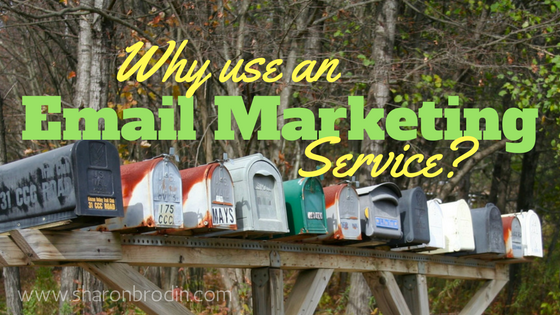 I use MailChimp and ConstantContact with clients because that’s where they already had an account. MailChimp is my least favorite one to use for designing. I find it clunky. But they have a free level, which is why so many use it. You’ll also want to look at things like the limits for emails allowed each month and the size of the mailing list allowed at each level. The rates for various levels are by no means standard! Starting an e-newsletter can be a daunting process, but it’s well worth the effort. Yes, there’s a lot of work on the front end. But using an email marketing service will help keep the process running smoothly and efficiently.